It is well known that the mechanical properties of hypoeutectic Al–7%Si alloys are influenced by the size, morphology, and distribution of primary α-Al and eutectic Si crystals. In the present work, a novel Al–Ti–C–Ce master alloy was prepared by the pure molten aluminum thermal explosion reaction, and its effects on the microstructure and mechanical properties of hypoeutectic Al–7%Si alloy were investigated. The results show that the Al–Ti–C–Ce master alloy containing α-Al, granular TiC, lump-like TiAl3, and block-like Ti2Al20Ce has excellent refining and modification properties for hypoeutectic Al–7%Si alloy. When 1.5 wt.% Al–Ti–C–Ce master alloy is added, the coarse dendritic α-Al in hypoeutectic Al–7%Si alloy is refined into equiaxed grains. The secondary dendritic arm spacing (SDAS) was also reduced, and the coarse needle-flake eutectic Si phase was transformed into a fibrous and granular phase. 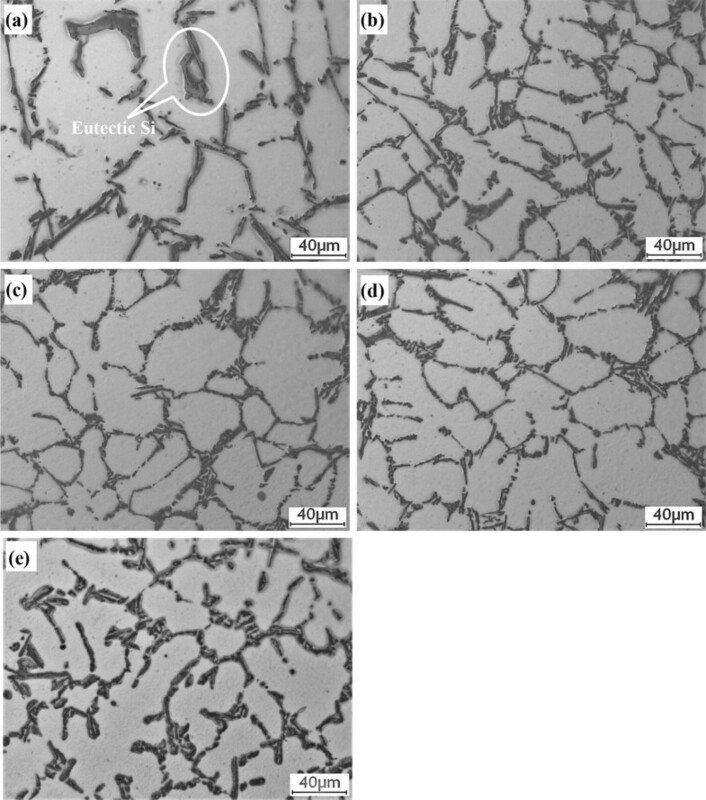 It was found that the ultimate tensile strength and elongation increased by 59% and 56%, respectively, due to the decrease in the SDAS of primary α-Al dendrites and the modification of eutectic Si crystals. Moreover, the change of mechanical properties corresponds to the evolution of microstructure. At present, the main modification elements are Na, Sr, Sb, etc., which can effectively improve the morphology of Si phase in Al–7%Si alloy and improve the mechanical properties of Al–7%Si alloy.10, 11, 12 However, there are some problems in the use of these modifiers, such as high cost and short duration of refinement and modification. In recent years, the unique chemical activity and surface adsorbability of single rare-earth (RE) elements or mixed RE elements have been recognized by many researchers,13, 14, 15, 16 who have tried to use them in the modification process of Al–7%Si alloys. Some studies have shown that14, 15, 16, 17, 18 La, Y, Ce, Er, and other RE elements have good modification and long-term effect. Based on the present state of research, RE elements have a certain modification effect on the eutectic Si phase, but which RE elements are more suitable as a modifier, the mechanism of modification, and the properties of the modified alloys still need to be further studied. It is well known that Al–Ti–B and Al–Ti–C master alloys are considered to be good refiners for aluminum and its alloys.19,20 Compared with TiB2 in Al–Ti–B master alloy, TiC particles in Al–Ti–C grain refiner have less tendency to be used as heterogeneous nucleating core and are not affected by elements such as Zr, Cr, Mn, and V. Therefore, the preparation, microstructure, and properties of Al–Ti–C master alloy have received more attention.19, 20, 21 It has been found that A1–Ti–C alloy has good refining effect on α-Al phase grains in hypoeutectic Al–7%Si alloy, but the modification effect on the eutectic Si phase is not satisfactory.22,23 Therefore, it is necessary to develop a master alloy that can refine α-Al phase grains and modify the eutectic Si phase at the same time. Although some scholars have successfully prepared Al–Ti–B–Sr,24 Al–Ti–C–Sr,25 and Al–Ti–C–RE26,27 alloys with grain refinement and modification effects using the fluorine salt and doping methods, due to the mutual poisoning of B and Sr28,29 or to the complex preparation process, there has been no industrial application. RE oxides have been widely used as reaction promoters in the preparation of composite materials,30,31 but their application in the synthesis of Al–Ti–C master alloys has not been frequently reported. 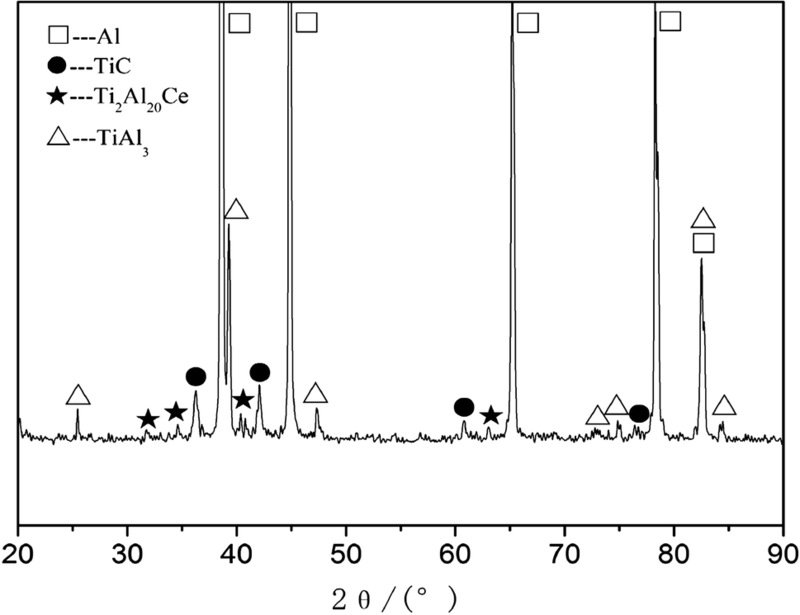 Wang et al.32 studied the effect of CeO2 on the thermodynamics of Al–Ti–C–RE prepared by the fluorine salt method, and the results show that the addition of CeO2 reduces the reaction temperature of the prepared alloy. 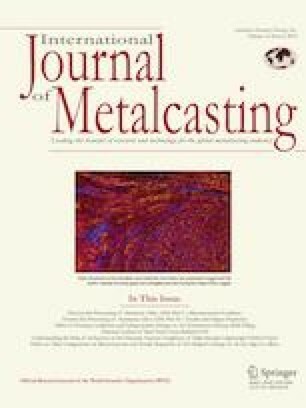 The author also found that the addition of CeO2 can improve the wettability of C and Al melts and promote the formation of TiC particles.33 But there are many problems; for example, the refining and modification efficiency of master alloy on industrial pure aluminum and hypoeutectic Al–8%Si alloy are not very satisfactory. For this reason, the author has carried out a lot of research work and further optimized the process parameters of the alloy. In this paper, a new type of Al–Ti–C–Ce alloy was prepared by the authors and its effect on the microstructure and mechanical properties of hypoeutectic Al–7%Si alloy were reported. The main raw materials for the preparation of Al–Ti–C–Ce master alloy include Al powder (99.6%, 61–74 μm in size), Ti powder (99.3%, 38–44 μm in size), C powder (99.8%, 11–30 μm in size), CeO2 powder (99.5%, 1–2 μm in size), and commercial pure Al (99.7%). First, the Al, Ti, C, and CeO2 powders are converted into precast blocks (Φ 25 mm × 50 mm) by ball mixing and cold pressing under a pressure of 50–60 MPa. The molar ratio of Al, Ti, and C powder is 5:2:1 in the prefabricated blocks, while the content of CeO2 is 4 wt.%. Second, the prefabricated block is added to a 820 °C aluminum melt. Approximately 10–15 min later, a graphite rod is used to stir the aluminum melt, and then the melt was held for 5 min at 820 °C. Finally, the melt was poured into a preheated (200 °C) cylindrical steel mold (50 mm in inner diameter and 30 mm in height) on a fire brick. The Al–7%Si alloy was prepared using commercial Al–12%Si master alloy and commercial pure Al (99.7%) in a clay-bonded graphite crucible by a 7.5 kW well-resistance furnace. The chemical composition of Al–7%Si alloy is presented in Table 1. The Al–7%Si alloy was remelted at 730 °C and held for 5 min in a clay-bonded graphite crucible by an electrical resistance furnace. And then a certain amount (0.5, 1.0, 1.5, and 2.0 wt.%) of Al–Ti–C–Ce master alloy was added into the melt at 730 °C. The melt was stirred thoroughly to ensure the homogeneity of the composition, and then the melt was held for 10 min at 730 °C. After the melt was degassed using commercial degasser of solid hexachloroethane (C2Cl6) and the slag was skimmed, the melt is divided into two parts, one of which is cast in a steel mold (50 mm in inner diameter and 30 mm in height) to obtain macrorefined samples. The other part was directly poured into a preheated (200 °C) book steel mold (20 mm in inner diameter and 120 mm in length) at 730 °C to obtain the tensile test bars. The phase composition of Al–Ti–C–Ce master alloy was identified using a Rigaku D/max-A X-ray diffractometer (XRD, PW 3040/60, PANalytical, Rotterdam, The Netherlands) with a range of 0.02° for each step, 2θ, and 20°–90° for Cu K radiation, and an image plate detector. The composition of the master alloy was measured using inductively coupled plasma atomic-emission spectrometry (ICP-AES, HK-8100, Beijing Huake Yi Tong Analytical Instrument Co. Ltd.) and an infrared carbon apparatus (CS-320C, Chongqing Research Rui Instrument Co. Ltd.). The chemical composition of Al–Ti–C–Ce master alloy is presented in Table 2. The microstructure of the samples was characterized by large optical microscope (OM, MEF3, Leica, Inc., Vienna, Austria) and a JSM-7500 scanning electron microscope (SEM, SSX-550 fitted with EDS equipment, Shimadzu Corp., Kyoto, Japan) after rough grinding, finishing of the grinding, and electrolytic polishing (10% HClO3 + 90% absolute alcohol, electrolyte composition in volume fraction, 20 V voltage). The average macroscopic grain size was determined by the linear intercept method. The secondary dendrite arm spacing (SDAS) and silicon particle size were measured and counted by Nano Measurer 1.2 image analysis software. According to GB/T 228-2002, the tensile test bars were processed from the cast round bars and then to evaluate the mechanical properties of the samples with different contents of Al–Ti–C–Ce master alloy. Figure 1 shows the configurations of the samples used for tensile tests. Tensile tests were carried out under the condition of room temperature and strain rate of 0.5 mm/min by using an MTS810 machine (MTS System Company, Eden Prairie, MN, USA). The tensile strength and elongation data of each alloy reported below are average values of three tensile specimens. The fracture surfaces of tensile specimen were analyzed by SEM to evaluate the fracture mechanism. Dimensioned schematic of the tensile specimen (unit: mm). Figure 2 shows the XRD pattern of the prepared Al–Ti–C–Ce master alloy. It can be seen that, compared with Al–Ti–C,34 the Al–Ti–C–Ce master alloy not only contains α-Al, TiAl3, and TiC, but also contains Ti2Al20Ce phase. Figure 3 shows the microstructures of Al–Ti–C–Ce master alloy. From Figure 3a, it can be seen that a large number of block-like particles are distributed on the aluminum matrix, most of which are gray, with some of them being bright white. In addition, it can be seen from Figure 3b that most of the granular particles are agglomerated at grain boundaries. To identify the different phases, EDS analyses were performed on the different particles. Based on the energy spectrum analysis of Figure 4a–c and analysis of the XRD pattern, the bright-white block-like particles were determined to be Ti2A120Ce, the gray lump-like particles TiAl3, and the granular particles TiC. XRD pattern of Al–Ti–C–Ce master alloy. 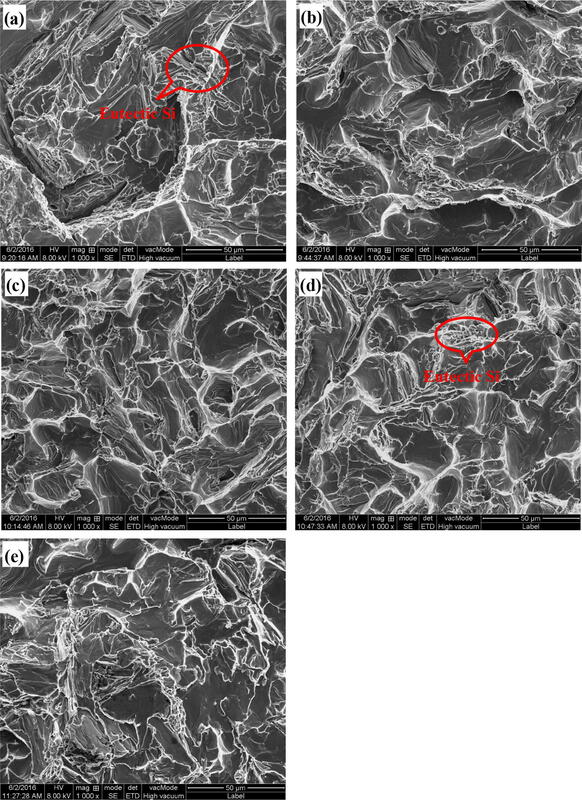 Microstructures of Al–Ti–C–Ce master alloy: (a) SEM image and (b) SEM image of TiC. EDS composition analysis of points A, B, and C in Figure 2: (a) point A; (b) point B; and (c) point C.
Finally, the reaction of TiAl3 and [Ce] creates a new Ti2Al20Ce phase in the solidification of molten alloy, while CeO2 is the promoter of reactants and reactions. However, these theories are preliminary speculation and are consistent with those advanced by Wang et al.32 Further in-depth study and analysis on the thermodynamics and dynamics are needed in the future. Figure 5 shows the macrostructures of hypoeutectic Al–7%Si alloy with different additions of Al–Ti–C–Ce master alloy. It can be seen that compared with hypoeutectic Al–7%Si alloy without adding Al–Ti–C–Ce master alloy, the macroscopic grain of hypoeutectic Al–7%Si alloy with adding 0.5 wt.% Al–Ti–C–Ce master alloy have been refined obviously, and the original coarse columnar grain has been replaced by fine equiaxed grain. As the addition of Al–Ti–C–Ce master alloy increases, the macroscopic grains of hypoeutectic Al–7%Si alloy become more refined. However, when the addition amount of Al–Ti–C–Ce master alloy is increased from 1.5 to 2%, the macroscopic grains begin to coarsen. 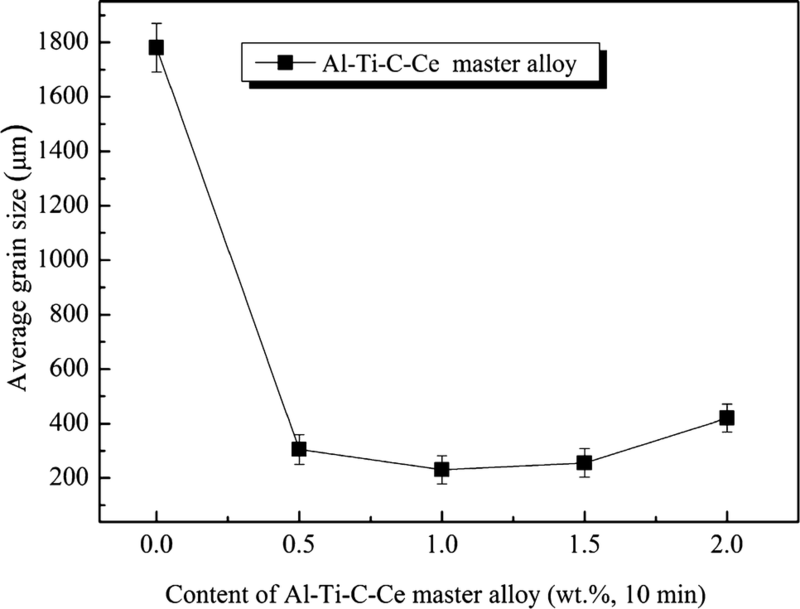 As can be seen from the average macroscopic grain size curve of hypoeutectic Al–7%Si alloy with different Al–Ti–C–Ce master alloy additions in Figure 6, as the Al–Ti–C–Ce master alloy addition increases from 0 to 1.0%, the average macrograin size of hypoeutectic Al–7%Si is refined from 1780 to 230 μm. When the addition increased from 1.5 to 2%, the average macroscopic grain size increased from 255 to 420 μm. Macrostructures of Al–7%Si alloy with different additions of Al–Ti–C–Ce master alloy: (a) unrefined; (b) 0.5 wt.%; (c) 1.0 wt.%; (d) 1.5 wt.%; (e) 2.0 wt.%. Average macroscopic grain size of Al–7%Si alloy with different additions of master alloy. Figure 7 shows the microstructures of α-Al in hypoeutectic Al–7%Si alloy with different additions of Al–Ti–C–Ce master alloy. It can be seen from Figure 7a that the α-Al dendrites of hypoeutectic Al–7%Si alloy without refinement and modification are coarse dendritic. It has clear primary and secondary branches and irregular appearance. From Figure 7b–d, we can observe that there is an optimal refining effect when the addition amount of Al–Ti–C–Ce master alloy is 0.5–1.0%. The primary α-Al dendrites are obviously refined and the primary and secondary dendrites also decrease and the shape is regular. However, when the content of Al–Ti–C–Ce master alloy is 2.0%, the α-Al dendrites began to change into dendrites. This proves that, with a certain addition level, the Al–Ti–C–Ce master alloy has a good effect on the refinement of α-Al dendrites in hypoeutectic Al–7%Si alloy. 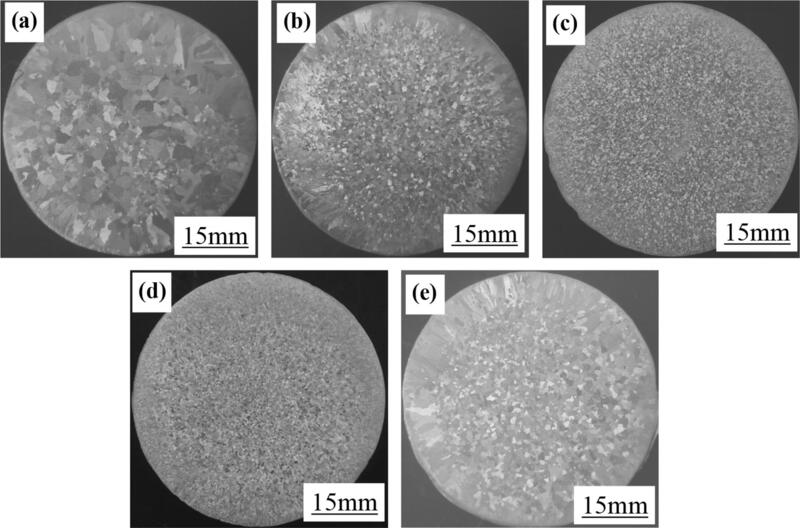 Microstructures of α-Al in Al–7%Si alloy with different additions of Al–Ti–C–Ce master alloy: (a) unrefined; (b) 0.5 wt.%; (c) 1.0 wt.%; (d) 1.5 wt.%; and (e) 2.0 wt.%. To further investigate the effect of adding different amounts of Al–Ti–C–Ce master alloy to eutectic Si, the microstructure was characterized by high-magnification optical microscopy and scanning electron microscopy, as shown in Figures 8 and 9. It can be seen from Figures 8a and 9a that the eutectic Si in the hypoeutectic Al–7%Si alloy without adding any master alloy is coarse and needle-flake-like and is distributed around the α-Al dendrites. When adding 0.5 wt.% Al–Ti–C–Ce master alloy into the hypoeutectic Al–7%Si alloy, the eutectic Si changes from coarse needles to short rods, with some of them still needle-flake-like, as shown in Figures 8b and 9b, indicating that the eutectic Si in hypoeutectic Al–7%Si alloy is not sufficiently modified by adding 0.5 wt.% Al–Ti–C–Ce master alloy. When the addition of Al–Ti–C–Ce master alloy was increased from 1.0 to 1.5 wt.%, the eutectic Si became fibrous and characterized by small granules. However, some fibrous eutectic Si began to coarsen into coarse needle shapes and large granular shapes when the addition continued to increase to 2 wt.%. It can be seen that the addition of 1.5 wt.% Al–Ti–C–Ce master alloy has a good modification effect on the eutectic Si in hypoeutectic Al–7%Si Alloy. 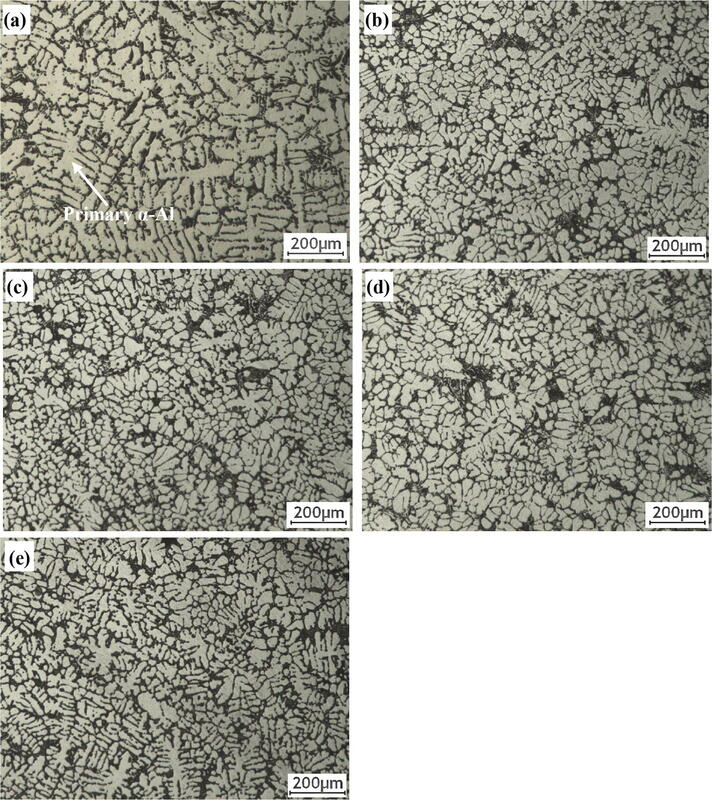 Microstructures of eutectic Si in Al–7%Si alloy with different additions of Al–Ti–C–Ce master alloy: (a) unmodified; (b) 0.5 wt.%; (c) 1.0 wt.%; (d) 1.5 wt.%; and (e) 2.0 wt.%. Magnified images showing effects of Al–Ti–C–Ce master alloy on eutectic Si structure in Al–7%Si alloy: (a) unmodified; (b) 0.5 wt.%; (c) 1.0 wt.%; (d) 1.5 wt.%; and (e) 2.0 wt.%. Figure 10 shows the relationship between the addition of Al–Ti–C–Ce master alloy and the secondary dendritic arm spacing and size of eutectic Si in hypoeutectic Al–7%Si alloy. It can be seen that the secondary dendritic arm spacing and the eutectic Si size in hypoeutectic Al–7%Si alloys first decreased and then increased with increasing Al–5Ti–0.62C–0.2Ce master alloy content. 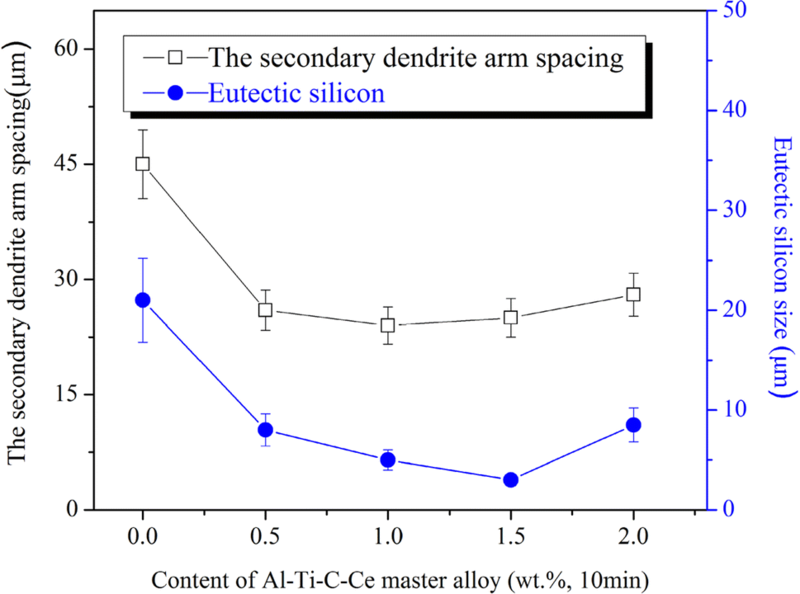 The addition of 1.0–1.5 wt.% Al–Ti–C–Ce master alloy can not only refine α-Al dendrites, but can also have a better modification effect on the eutectic Si in hypoeutectic Al–7%Si alloy. Relationship curve between the addition level of Al–Ti–C–Ce master alloy and the SDAS and eutectic Si size in Al–7%Si alloy. It is well known that when the master alloy is added to the aluminum melt, the aluminum base of the master alloy will melt rapidly and release a large number of α-Al heterogeneous nucleation particles35,36 or Si-modified elements. In the present work, compared with Al–Ti–C, the Al–Ti–C–Ce master alloy not only contains more TiC and TiAl3 particles, but also contains Ti2A120Ce. When Al–Ti–C–Ce master alloy is added to the aluminum melt, the TiC released from the Al–Ti–C–Ce master alloy matrix can be used as a good nucleating agent for α-Al because of the low lattice mismatch between TiC and α-Al37,38 and the activity and stability of TiC with the assistance of TiAl3 (i.e., the formation of a Ti–rich layer39,40) during the refining process. While the Ti2A120Ce will dissolve and provide a large amount of free Ce atoms for the aluminum melt, it has been reported that Ce and other RE elements have good modification and long-term effects.14,17 Therefore, with increasing Al–Ti–C–Ce master alloy content and the dissolution of Ti2A120Ce, there is a large amount of free active Ce in the aluminum melt. From the perspective of twin geometric growth,41 because the atomic radius of Ce is 0.183 nm and that of Si is 0.143 nm, and the ratio of the two is 1.280, which is very close to 1.648, Ce plays a leading role in the modification of the Si phase. It has been reported that, in the case of grain refinement of Al–Si alloys, Ti in the master alloy and Si can be coated with Ti silicide on the surface of TiAl3, which poisons the effectiveness of the nucleation in the master alloy.42 Qiu et al.43 also found that the crystal matching of Ti5Si3 and TiAl3 is better than that of Al matrix. Therefore, the Ti content in the master alloy should be kept at a low level when the Al–Si alloy is refined.44 In our experiment, an increase in SDAS and eutectic Si coarsening appeared when the addition amount of Al–Ti–C–Ce master alloy reached 2 wt.%. This phenomenon is consistent with the above research reports. The main reason may be that when the addition of Al–Ti–C–Ce master alloy exceeds 1.5 wt.%, with the increase in master alloy addition, there will be excess Ti in the melt, which will form titanium silicide with Si. It not only poisoned the nucleation efficiency of TiAl3 and TiC, but also affected the modification of Ce. However, the theoretical analysis is an inferential model up to now because no direct experimental proof has been observed, so further study will be made in the future. 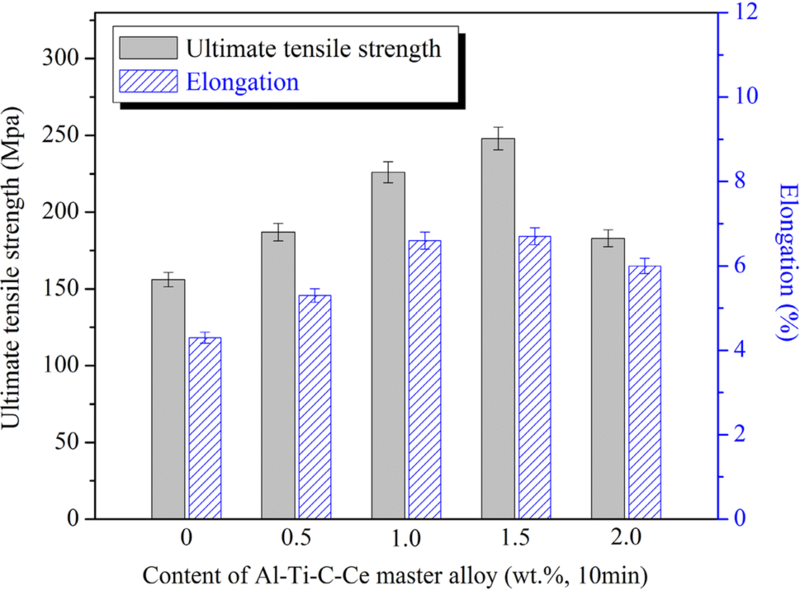 Figure 11 shows the trend of tensile strength and elongation of Al–7%Si alloy with the addition of Al–Ti–C–Ce master alloy. It can be seen that Al–Ti–C–Ce master alloy has a significant effect on the tensile properties of Al-7%Si alloy. The tensile strength and elongation of Al–7%Si alloy without the addition of master alloy are 156 MPa and 4.3%, respectively. With increasing Al–Ti–C–Ce master alloy content, the tensile strength and elongation first increased and then decreased. When the amount of Al–Ti–C–Ce master alloy added was 1.5%, the tensile strength and elongation reached their peaks, 248 MPa and 6.7%, an increase of 59% and 56%, respectively. However, the tensile strength and elongation of Al–7%Si alloy decreased obviously upon further increasing the amount of Al–Ti–C–Ce master alloy added. Al–Ti–C–Ce master alloy refines α-Al dendrites and modifies Si particles, which is the important reason for the change in the properties of hypoeutectic Al–7%Si alloy. Decreasing Si particle size and increasing roundness decrease the probability of Si particle cracking and increase the resistance of microcrack initiation. In addition, the refinement of α-Al grains leads to the increase in resistance of dislocation movement. As a result, the work-hardening rate of the α-Al matrix increases, and the deformation of the alloy can be carried out in a more coordinated manner, thus effectively preventing the accumulation and growth of microcracks. Therefore, under tensile load, the alloy can withstand more deformation, and the strength and plasticity of the alloy can be improved obviously. Mechanical properties of Al–7%Si alloy with various concentrations of Al–Ti–C–Ce master alloy. Figure 12 shows the fracture morphology of hypoeutectic Al–7%Si alloy for different Al–Ti–C–Ce master alloy contents. As shown in Figure 12a, a clear cleavage surface can be seen in the fracture structure of the unrefined Al–7%Si alloy, which shows the typical brittle fracture nature. This is because the Al–7%Si alloy is composed of coarse α-Al dendrites and flaked eutectic Si, which leads to premature cracking caused by tensile stress concentration. When 0.5 wt.% Al–Ti–C–Ce master alloy was added, it can be clearly observed from Figure 12b that the area of cleavage planes significantly decreases and the number of dimples increases on the fracture surfaces due to the refinement of α-Al dendrites and the eutectic structure. As can be seen from Figure 12c, when 1.0 wt.% Al–Ti–C–Ce master alloy was added, a large number of dimples and torn ridges were observed. On the fracture surface of Al–7%Si alloy with addition of 1.5 wt.% master alloy, the ductile fracture type is found. Owing to the reduction of the size and the passivation of the sharp angle of most of the eutectic Si, the cleavage effect of the eutectic Si on the aluminum substrate is reduced. In the unrefined hypoeutectic Al–7%Si alloy, the dendritic α-Al is very coarse and the secondary dendrite is abundant and the eutectic silicon is distributed in the α-Al matrix as a long needle. Under the action of tensile stress, stress concentration and crack initiation are easy to occur at the dendritic tip and at the sharp corner of eutectic silicon, which makes the alloy material exhibit poor properties.45,46 After adding 1.5 wt.% Al–Ti–C–Ce master alloy, not only the α-Al phase is refined, but also the size is obviously reduced and the angle is passivated, while the long acicular eutectic silicon also becomes spherical and granular. As a result, the slip distance of dislocation is shortened, the number of dislocations accumulated in front of obstacles is smaller, and the stress concentration at grain boundaries is smaller. For this reason, it is necessary to increase the applied stress in order to start the source of dislocation in the crystal. Therefore, the alloy materials with better refining and modification effect have difficulty in crack initiation, and show better strength and toughness.46 However, as the Al–Ti–C–Ce master alloy content was increased to 2.0 wt.%, the fracture was made up of cleavage surfaces and dimples, as shown in Figure 12e. This is due to the increase in the size of α-Al phase and eutectic phase in the alloy, which has the effect of splitting the matrix, which seriously affects the mechanical properties of the hypoeutectic Al–7%Si alloy. 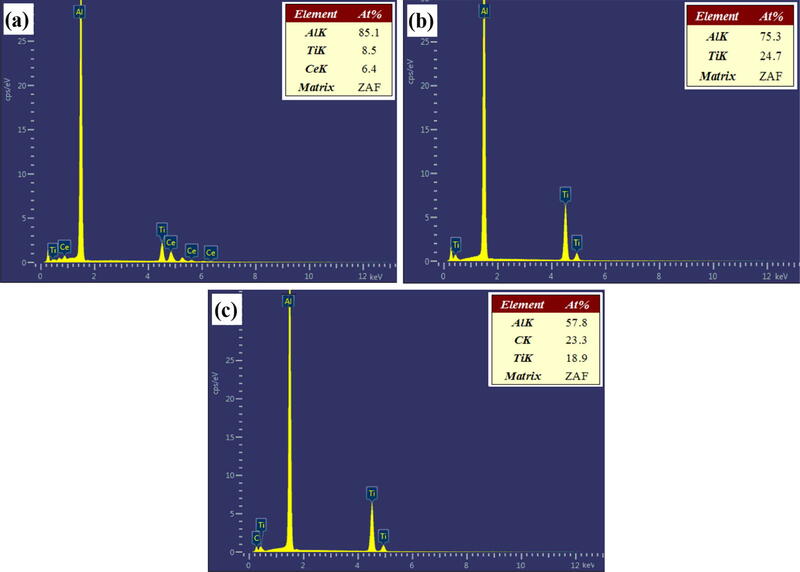 Fractographs of the tensile samples of Al-7Si alloy with various contents of Al–Ti–C–Ce master alloy: (a) unmodified; (b) 0.5 wt.%; (c) 1.0 wt.%; (d) 1.5 wt.%; and (e) 2.0 wt.%. The above results show that Al–Ti–C–Ce is an excellent master alloy, which can not only refine α-Al dendrites in Al–7%Si alloy, but also modify eutectic Si, thus improving the tensile strength and elongation of Al–7%Si alloy. By increasing the content of Ce in Al–Ti–C–Ce master alloy, a new type of Al–Ti–C–Ce master alloy with better properties may be prepared. Therefore, a new method of preparing Al–Ti–C–Ce master alloy by adding CeO2 in the thermal explosion reaction of pure aluminum is proposed, which provides the possibility for industrial application. When the amount of CeO2 is 4%, the synthesis temperature is 820 °C, and the holding time is 10–15 min, the new type of Al–Ti–C–Ce master alloy can be prepared in the thermal explosion reaction of pure molten aluminum. With increasing Al–Ti–C–Ce master alloy content, the secondary dendritic spacing and eutectic Si size of hypoeutectic Al–7%Si alloy first decreased and then increased. 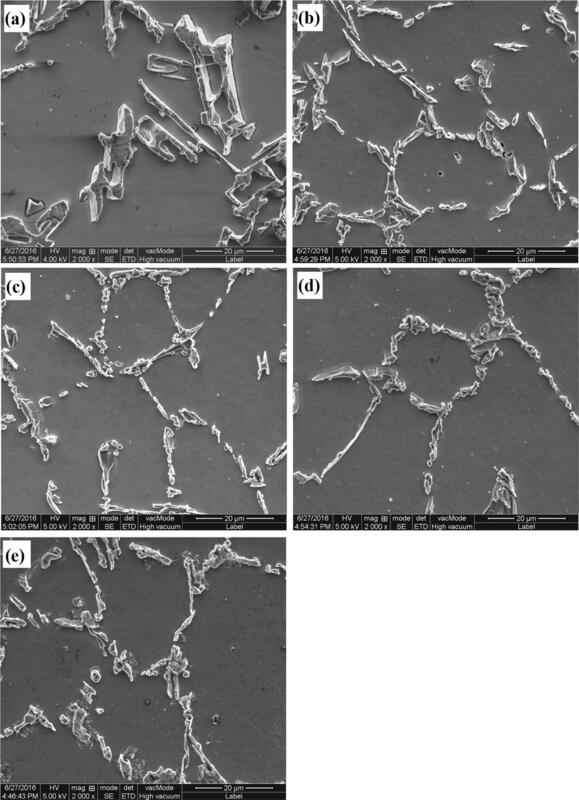 Addition of 1.5 wt.% Al–Ti–C–Ce master alloy not only refined the α-Al dendrites from coarse to fine equiaxed grains, but also modified eutectic Si from coarse needle flakes to fibrous and small granules. With increasing Al–Ti–C–Ce master alloy content, the tensile strength and elongation first increased and then decreased. When 1.5 wt.% Al–Ti–C–Ce master alloy was added, the tensile strength and elongation reached their peaks, 248 MPa and 6.7%, an increase of 59% and 56%, respectively. We would like to thank LetPub (www.letpub.com) for providing linguistic assistance during the preparation of this manuscript. This research was financially supported by the National Natural Science Foundation of China (Nos. 51661021; 51665033). The authors would like to acknowledge the financial support of the Natural Science Foundation of Gansu Province in China (No. 1606RJZA161) and Gansu key research and development program (No. 18YF1GA061).